Killaloe has never entered a team into the community games rugby before so it was very exciting to be able to field a team, albeit a very young one. 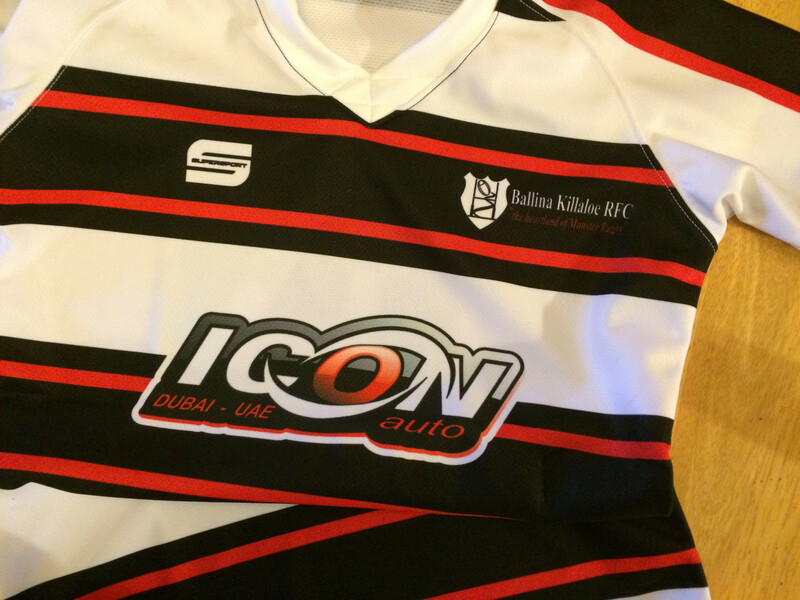 Only one of the boys currently plays U11 rugby, the rest play U10 & U9! Semi final: Doora Barefield A v Killaloe – Doora Barefield were very strong and scored 4 tries in the first five minutes. (They were the overall winners on the day). The Killaloe boys never let their heads go down and battled hard for the rest of the game only conceding one more try before the final whistle blew. 3rd/4th playoff: Killaloe v Doora Barefield B – the team was determined to come away with a medal and they did! They tackled as if their lives depended on it and played some great rugby. Try scorers were Ciaran Rodgers (3), Gordon Wood (2), Shane Geraghty (1), Stephen Geraghty (1). Team: Tony Foley, Ciaran Rodgers, Laurent Chateau, Stephen Geraghty, Shane Geraghty. 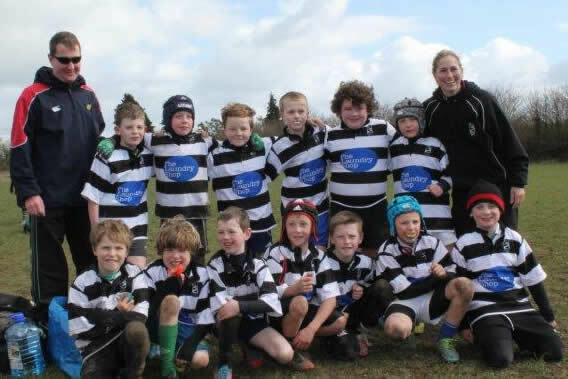 On Sunday 23rd March the BKRFC U10s travelled to Rathuard in Limerick to play a blitz hosted by Presentation RFC, where they were also up against two UL Bohs teams and the East Clare Eagles from Tulla. The Ballina Killaloe boys came out firing on all cylinders in the first game rucking the ball, tackling well, turning over the ball at almost every breakdown, eventually running in 7 tries against the first UL Bohs side who scored just one in reply. The second game promised to be tougher with BKRFC falling behind by 4 tries to 2. In the last minutes of the game the boys rallied with some strong play towards the line. Oisin Pepper darted into the corner from short range. As full time approached almost exactly the same play unfolded and Oisin saw his chance again as the blindside was unmarked and he dived across the line to draw 4-all against the second UL Bohs team. The 3rd and final match was against East Clare Eagles. Once again the boys played well winning the game with some lovely well-worked tries. It was a great morning with over half of the boys scoring tries, but a special mention must go to Shane Geraghty and Thomas O’Farrell for their tenacious tackling and strong running with the ball in hand. 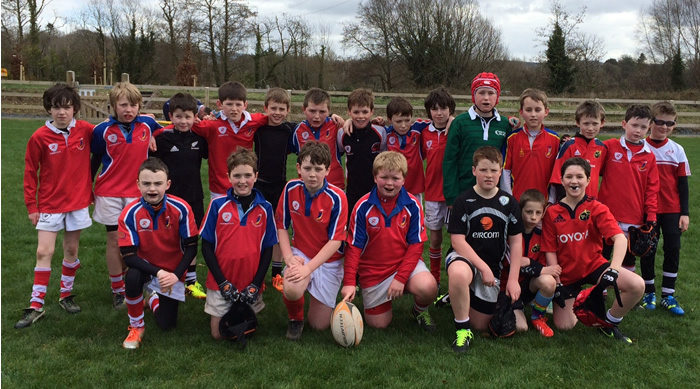 On Sunday 23rd March 2014, our U11s hosted teams from UL Bohs, St Marys RFC, and Scarriff RFC. Ballina Killaloe RFC fielded two teams. It was the first time that many of our boys set foot on our new hallowed ground and boy did they do it justice. All our stars were aligned because the pitch was magnificent, the sun was shining and the standard of rugby was fantastic. Our visitors were blown away by our new facilities! The standard of rugby on display was of a high quality and some of the BK RFC play was so good that visiting coaches remarked on the high standards displayed by our boys on the pitch. 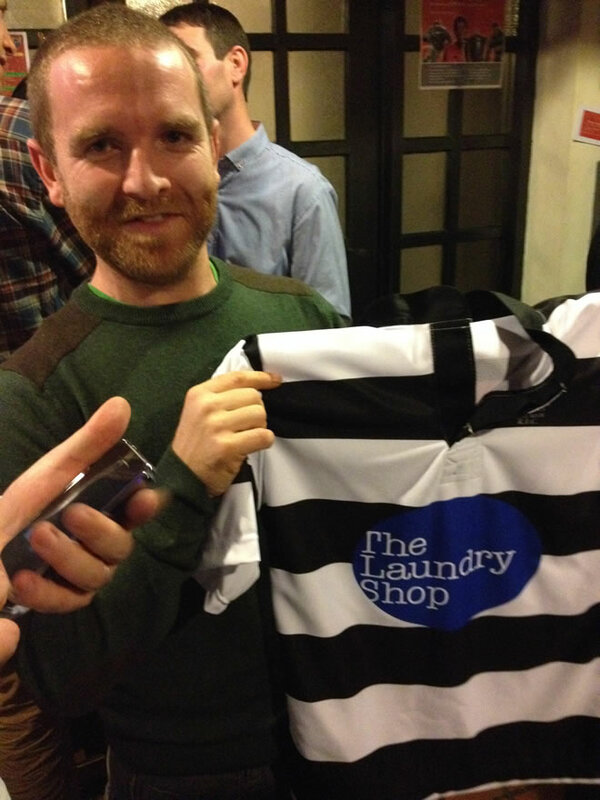 The Club is delighted to welcome The Laundry Shop, Ballina/Killaloe as one of its jersey sponsors for the 2013/2014 Season. Donal Hammond of The Laundry Shop officially presented a set of mini rugby jerseys to Club President Brendan Foley at a presentation evening which took place in Reddans Bar, Killaloe on Friday 20th December 2013. 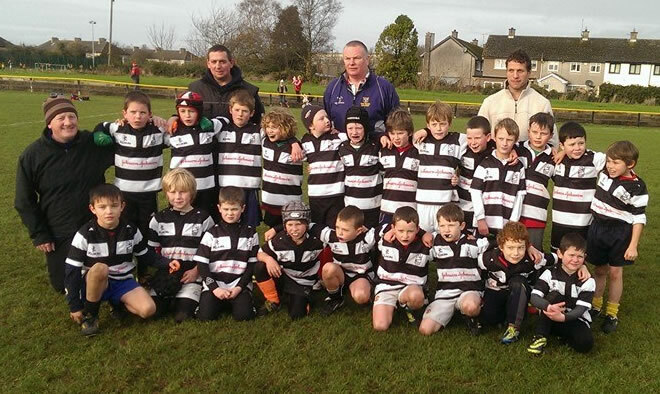 Ballina Killaloe RFC U9s travelled to Tom Clifford park in Limerick to play Young Munsters on Sunday 8th of December. 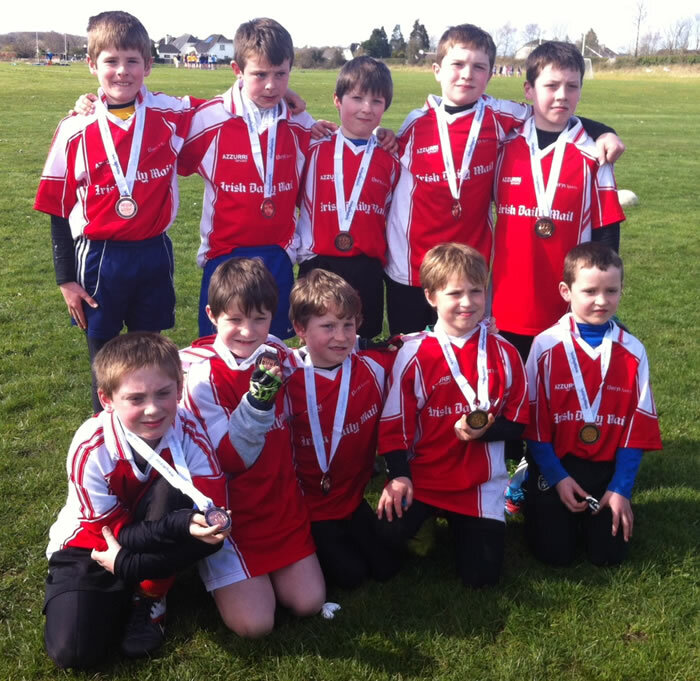 Ballina Killaloe fielded 2 teams from a squad of 22 players. Both teams played two very competitive games with Ballina Killaloe wining all four games 6-0, 4-1, 4-2 and 4-1. The ball handling and tackling skills worked in training over the last few weeks was very evident in the way the boys controlled each game and kept Young Munster under pressure at all times. Ballina Killaloe RFC U12s played in a blitz, hosted by Old Crescent, on Sunday 1st December 2013. We fielded 2 teams, but unfortunately one of the teams was weakened when 3 players got sick Saturday night and weren’t able to play. However that team played 3 matches, getting 2 players from opposing teams and handled themselves very well. They played 2 Old Cresent teams, going down in both games, 5-3 and 3-2, but fought back well in both games. However thay saved thier best for the last game and beat UL Bohs 4-2. 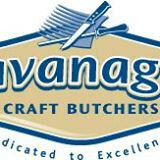 Gearoid Rogers, Josh Egan, Jack Mcevoy and Brian Cahill shone for BKRFC. The other team had a full turn out and had a very succesful outing, winning all 4 games, beating 2 Old Crescent teams 3-1 and 5-3, then going on to come from 2 down to beat Ul Bohs 6-2 and Ennis in the last game 5-2. Tadhg O’Shaughnessy had one of those days when everything stuck and scored 7 tries. Ivor Larkin’s work rate around the pitch was second to none, while David Grace crontrolled the back line very well. Christopher Ryan also showed a clean pair of heels running a few tries. Q. You represented Canada in the recent Junior World Cup in Chile. Could you tell us how that came about and what was the whole experience like? To play for Canada in the Junior world Trophy was an incredible experience rugby wise and travelling wise. I got to see part of the US, Canada and South America. 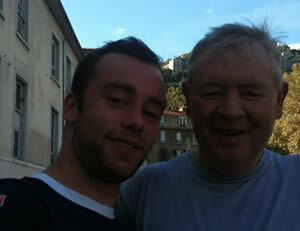 The standard of international rugby is great and the exposure was great too as I’m now in France. I’m eligible to play for Canada because Mum was born in New Brunswick. So, when I wasn’t wanted for the Irish 20’s I decided I wanted to play international rugby so contacted Rugby Canada’s Mike Shelley who helped make it all possible. Q. You joined French Top 14 side Grenoble at the start of this season. How have you found the move from both a cultural and rugby-style perspective? The move has its ups and downs. At the start I was very lonely after the first six weeks but now I have settled and I am really enjoying it. The rugby here is not as structured so as a 10 I found it difficult at the start because I couldn’t understand everything the players around me wanted to do off the cuff but I have all the calls now so its all good. 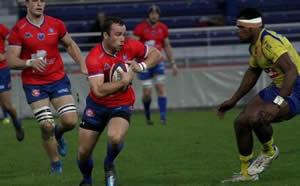 Q. You’ve been selected in the 23 man squad to play rivals Bayonne in the Amlin Challenge Cup opening game. How does it rank with your achievements so far in rugby? Obviously to have played 2 professional games since I’ve arrived is huge for me as well as hugely surprising for me. I had never thought that I would have played with the first team by this stage before I made the move here. Without a doubt my dad has been the biggest influence on my career from coaching my teams as a young lad, to advice about the game and both my parents have been hugely supportive always with rugby. Giving me lifts to training before school when I was younger and driving me to Limerick 4 times a week when I was playing with Young Munster RFC and encouraging me. Q. What are the biggest differences between the Irish, French and Canadian attitudes to training and rugby style? Q. 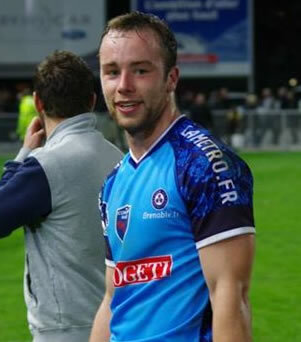 The French Top 14 has a number of well known players from Celtic and English clubs. Who are you most looking forward to playing against? I ‘m looking forward to meeting Ronan O’Gara and Jonathan Sexton in early 2014 when Grenoble play Racing Metro at home. Q. What advice would you have for any young rugby players looking to make a career out of the sport? My advice for people would be that you have to work hard at whatever sport you play if you want to succeed. It won’t always be easy and straight forward, but you have to believe in yourself and keep on trying. Q. Are we likely to see you pull on the Canadian national jersey in the 2015 rugby world cup? As of yet I havn’t declared for Canada, but obviously that would be amazing if it was to happen. First game for Canada is against Ireland too! Q. Who do you fancy for this year’s Heineken and Amlin Challenge cups? I think with the squad that Toulon gave this year it will be hard to stop them for the Heineken Cup and its too early to say for the Amlin. There will be some good team from the Heineken Cup in the later rounds. Q. What are your thoughts on the possible demise of the Heineken Cup? I can understand the different points of view but I’d hate to see it go. It’s always been very exciting and it’s the best club competition in the world! Q. Being a devout Munster man, would you consider playing for any of the other Irish provinces? How much money would it take for Leinster to sign you? I hear they’re short a decent fly half! I’d consider any offer for me to play rugby back at home in Ireland but it would be a funny one having to pull on a Leinster jersey alright ha!ha! Many thanks to Shane for taking the time to answer the questions. We wish him the very best of luck in what promises to be a long and successful career within professional rugby. Shane is a shining example to all young players within the Club and is testament to the adage that you get out what you put in. 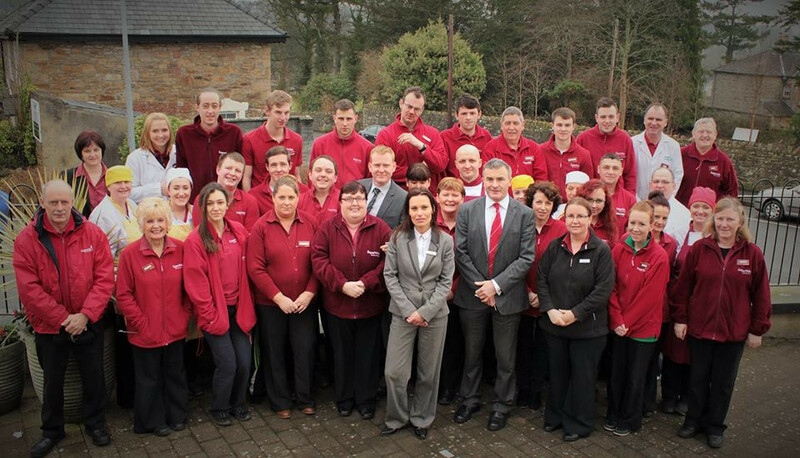 Well done Shane and best wishes on your continued success.